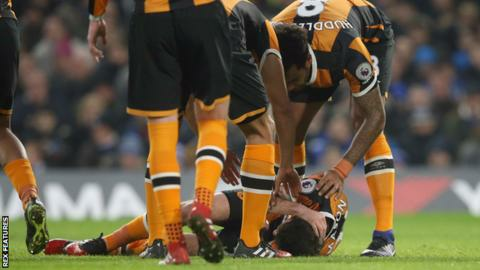 Hull City midfielder Ryan Mason is to see a third specialist on Monday to see if he will be able to return from the fractured skull he suffered in January. The once-capped England international, 26, had to have surgery after a clash of heads with Chelsea's Gary Cahill. "It's a difficult situation," head coach Leonid Slutsky told BBC Radio Humberside. "One doctor is saying one thing and another saying another, so he will get a third opinion on Monday." After eight minutes of treatment on the pitch during the Premier League match at Stamford Bridge, Mason was given oxygen as he was carried off on a stretcher. Mason returned to Hull's training ground for the first time since the incident earlier in May and described going back as "a massive step". Slutsky added: "He will have a decision about his future, if he needs an operation or not. "Ryan is a big hero for me, but now the question is not just about football but about his life. It's very serious." "He wants to play but he must make a decision not only about himself but also his family. It's more than only football."